BlackBox Password Manager is a security tool for protecting and organizing passwords on several social networks and other websites. This utility developed by Best Security Tips is lightweight. 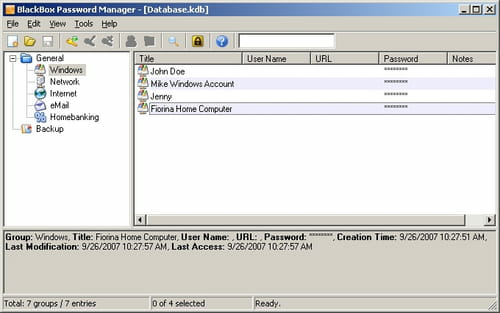 Once installed on the computer system, BlackBox Password Manager lets users import all passwords and secure them in a single file. This data can be transferred from one file into another. Importing data from TXT and CSV files is feasible too. Each inserted password can be categorized by genre and Website. The title, the user name as well as the URL linking to the Website and the password will be displayed on a single page. There is a little space to type notes. This single file is protected with a unique passcode named Master Password. This means that the user just has to remember this password and store others in the database. Meanwhile, even without that the local database is already highly encrypted. This function is utterly feasible with BlackBox Password Manager. The database can be saved in several formats including TXT, XML and CSV. Note that it can be saved to other applications. Usernames and passwords can be copied to Windows clipboard. BlackBox Password Manager can generate strong password. This is a freeware. Latest update on April 11, 2016 at 05:42 AM.